As I mentioned a while back, I'll occasionally post new sprites I've been making in Sundays. I've got a few today from AMAZE. After the recent jam ended, I decided to try and update some of AMAZE's graphics. So far, the game's graphics have been almost entirely composed of placeholders, and they look really terrible. Along with that, I've been meaning to try and improve my pixel art skills recently. First, I tried to make the generic looking 'diamonds' into some kind of cool blue crystal. It looks pretty, but I probably won't keep this. It doesn't really feel like what I was trying to go for. The next sprite I went for was the awful giant coin. I tried to turn it into a few modest stacks of gold coins, and I think I succeeded very well here. This sprite is probably a keeper, although I may alter it a bit in the future. 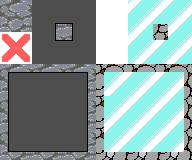 Lastly, I started work on the tileset. Ignore the right half-it's just old stuff. So far, I've only redone the floor texture. It looks much better than before, but I'm still not too happy with it for some reason. For now, I'm gonna stick with it, though. That's all I've got so far. I think I've made some decent progress in terms of art, but I still have quite a ways to go. Hopefully I'll iron out those pixel art skills with the next few projects. In the meantime, AMAZE is still progressing nicely and I should have plenty to write about on Friday.